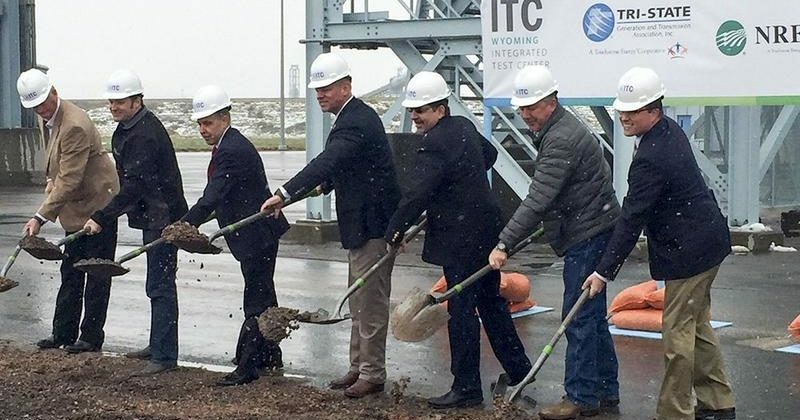 It might not be a white knight riding to the rescue just yet, but a glimmer of hope came for the state’s beleaguered coal industry this week in the form of Wednesday’s groundbreaking ceremonies for the Wyoming Integrated Test Center near Gillette. The event kicked off construction of the $21 million center, which will be a base for researching low-carbon energy technologies. The groundbreaking was attended by Governor Matt Mead and representatives from Basin Electric Power Cooperative, the Tri-State Generation and Transmission Association, the National Rural Electric Cooperative Association and the Wyoming Municipal Power Agency. The WITC is located at the Dry Fork Power Station, which is owned by Basin Electric. The WITC is a public-private partnership that hopes to spark the next generation of energy technology, centering on research into carbon capture, utilization and sequestration technologies using coal-fired flue gas from the Dry Fork Station plant. With the backing and support of the governor, the Wyoming legislators allocated $15 million in funding in 2014 for the design, construction and operation of the center. An additional $5 million commitment from private industry was required under the appropriation, which has since been secured from the Tri-State, with an additional $1 million pledged coming from the National Rural Electric Cooperative Association. As well as providing the WITC’s location, Basin Electric is providing in-kind contributions to the project, including engineering and construction management services. When finished, the WITC will be one of only a handful of such facilities in the world, and the second such facility in the U.S. The facility allow for real-world carbon capture testing on-site, “alleviating typical concerns over transferring the technology from a plant to the lab,” according to a release from Basin Electric. The center is scheduled to be completed and ready for use by mid-2017. An hour-long roundtable discussion with Mead and representatives of the participating companies followed the ceremony.